The Bat! 5 — новая версия популярного почтового клиента с удобным интерфейсом и множеством уникальных функций. Поддерживается создания неограниченного числа почтовых ящиков POP и IMAP, шифрование переписки с помощью PGP, имеется мощная система сортировки почты, диспетчер писем для оповещении о приходе почты на сервер и множество других, не менее полезных возможностей. В версии The Bat! Professional имеются словари для проверки орфографии, функция аппаратной аутентификации на почтовых серверах, возможность шифрования почтовой базы, многоязычный интерфейс с поддержкой русского языка. 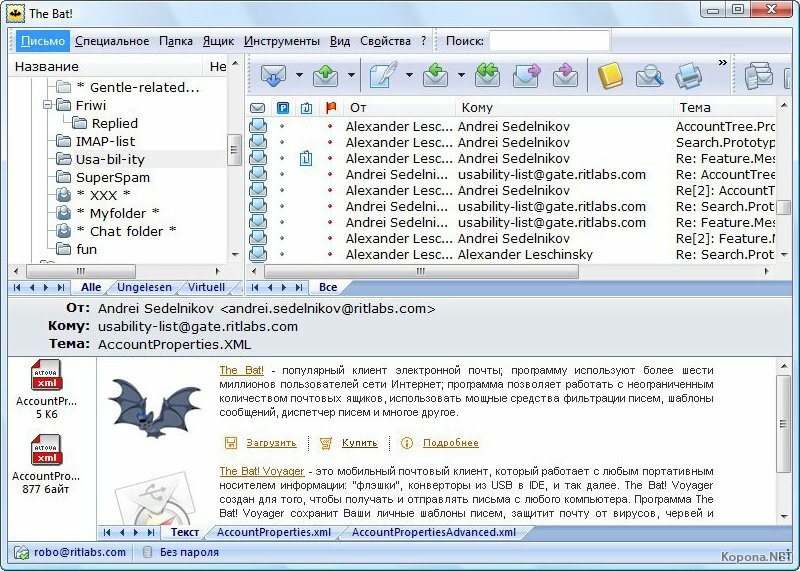 The Bat is an e-mail application that supports multiple POP3 accounts, true multithreading, MIME and UUencode standards, multimedia, message templates, minimization to the system tray, message notification, APOP authorization, and PGP. You also will find a fast and comfortable message editor with text highlighting, as well as a mail dispatcher for managing messages on servers. The application's other features include automatic dial-up networking (configurable for multiple accounts) and the option to include a photo with each address-book entry. There also are enhancements, such as message coloring, flagging, advanced filtering, speed improvements, and virus protection. The Bat!’s characteristic feature is the most widespread support of authentication protocols and of encryption while working with mail servers. The Bat! is one of the most protected mail clients, it is adopted by many companies for which privacy protection is a matter of life and death. The most recent versions of The Bat! have smart security buttons for each message that help in making users’ information really private. The other side of safety is protection against malicious codes. Unlike other email applications, The Bat! does not start scripts automatically. The Bat! benefits of its own HTML viewing mechanism – Robin HTML Viewer, as well as of its own image viewing module. These mechanisms protect you from viruses aimed at operating system mechanisms vulnerability. Windows Vista users should know that The Bat! benefits of Windows Vista’s Address Space Layout Randomization (ASLR) and Data Execution Prevention (DEP) for protecting the computer from viruses and malicious codes spread via email. The Bat! 4.0 and further versions are upgraded with a URL manager for background HTML image retrieval. This manager successfully fights malicious codes inserted into HTML images. Не рекомендую переходить в связи с очень тормознутостью (очень медленной работой) в отличии от 4-й версии. 4-ка летает на pentium D 3 гг 2 гб озу эта еле работает, но на core2duo 9300 4-х ядернике разницы практически не видно. Лажа 4-ка в сто раз лучше!!! Качайте с ifolder, depozit совсем не качает, еле-еле.